I want to move now to my doubts about Sober’s contention that non-human design is undetectable. I suggested in the last post that even human design is detected by non-materialist means, though that does not exclude human design from science. In a comment on the first post, Gregory suggests that the insistence on methodological materialism is limited to some scientists even in the natural sciences, and to fewer in the human sciences. To me that would suggest that, whilst detecting non human design must be more difficult, and less reliable, than in the human sciences, it must not be precluded altogether. Though die-hard materialists would never accept it, many in the human sciences might find themselves convinced that evidence for it was sufficient and, more important in the long run, people generally might conclude that science does not, in fact, outlaw their intuitions. The decision must be made on the actual evidence, then, rather than a priori. From what I have read (I repeat I’ve not had access to his actual writing) Sober’s case is that detecting design requires two filters: one along the lines of William Dembski’s design filter, and the second based on knowledge of the designer. The latter, it seems, is problematic to him mainly on the grounds that an alien designer’s work could be undetectable to us as design. I’m not sure how much this is really a problem. ID writers like both Dembski and Behe accept that much design may not be detectable. Behe, for example, as a Catholic, does not believe that evolution is a purposeless process in which God is involved only in cases of irreducible complexity. Rather, he suggests irreducible complexity is the detectable instance that reveals God’s involvement in evolution. So Sober’s suggestion that aliens might not see a series of prime numbers as indicative of design, or that their idea of design might look random to us, only means that not all design is detectable. If both the aliens and us were into prime numbers, then our instinctive sense of design would be shared, and we would infer design as correctly as we would in the case of a Babylonian list of primes. In the case of extraterrestrials, as in the SETI program, how likely is it that they would be so profoundly different to us that our communications would pass like ships in the night? Michael Denton, in Nature’s Destiny, by showing just how finely tuned the very chemistry of the Universe is, has suggested plausibly that life, especially intelligent life, probably has relatively few options. Simon Conway Morris, from his different convergent evolution approach, whilst suspecting that we may be alone in the Universe, thinks that intelligent life is likely always to have much in common with us. It is pretty likely, therefore, that any extraterrestrial intelligences would share similar chemistry, and for that reason a comparable environment in which would develop a similaqr kind of intelligence. Certainly they would be part of the same physical cosmos, and by most accounts their mathematics would describe the same realities as ours. 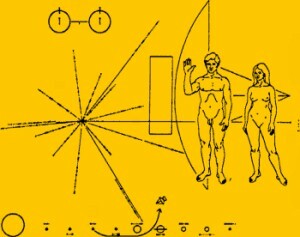 It remains uncertain that aliens could decode the Voyager plaque – many humans can’t! But it does appear likely that they would be intrigued by it and conclude, rightly, that it was designed. If Denton and Conway Morris are right, then they might be similar enough to gain some knowledge of the designer by the artifact. I have written before that biologists are completely incapable of describing anything in biology, even evolutionary processes, in anything other than teleological language. One might paraphrase that, without exaggeration but with apologies to Dobzhansky, as “Nothing in biology makes sense except in the light of teleology.” If that were not so, ateleological language would be the rule, rather than the exception. Design inference from nature is near universal, and one of the hardest tasks of materialists is to keep it in check. Why should that be? At its most basic, since for whatever reason our mental faculties are able truthfully to comprehend much of the nature of the cosmos, then they must also be reflecting some of the nature of any being who designed it. More strongly, if the Abrahamic God is the Designer, then we have been created in his image and he is not alien at all. Other, yes, but alien, no. Let’s pull this together. Sober’s case rests mainly on the failure of the design inference because of the dissimilarity of a non-human designer. He accepts that our intuitive recognition of human design is at least reasonably reliable. It follows, then, that it would also be reliable to the extent that aliens, or deities, are similar to us. Or conversely, that the recognition of design is evidence (at a human, rather than a materialist, level) that there is a designer with some characteristics in common with us. There might well be differences which mask the fact of design from some of such a designer’s work. But in other cases design might still be obvious, but different enough from our own efforts to teach us something new about the designer. All it would take would be an admission that our instinctive sense of design is, at least to some extent, a reliable means of gaining information. And we have as much evidence for that as for the reliability of scientific reasoning. Which ‘design/Design’? and w(W)hose ‘design/Design’? are additional relevant questions. Gregory, if that conclusion is right, I’d say it gives some weight to the longer term ID-in-nature program (seen here as a natural theology project). If non-human design is detectable in as defensible a sense as that assumed in the human sciences, for the reasons my three blogs has put forward, then it’s possible, at least on a weght-of-evidence basis, to posit design in nature. Enter Dembski and all his angels, stage left, to do the math. But from the discussion about Sober’s argument, that design has to be attributable to agent or agents whose intelligence is analogous to ours. Under what circumstances might that be? I argued for “aliens” to be biologically similar to us – but I guess they’d by that token be unlikely to be found to have either the level of sophistication or the methodology to engineer life. A divine being, as Sober says, might in principle be entirely other to us, in which case design would not be detected. But if it were, it would suggest he is somewhat like us – or rather, that we are somewhat like him. The Abrahamic God would fit that bill through the revealed doctrine of man’s creation in his image, whereas more philosophical conceptions of God would seem to lack any good reason for such a similarity. So at that stage, ID’s agenda would become to argue for and against the Abrahamic God as the Detected Designer. It’s doubtful that one could get much further, but it is a natural theology agenda, as weak as those always are, and would seem to arrive at the Biblical God rather than starting with him as a presupposition. That’s not my agenda, but might seem to follow from what I’ve said. BTW given Sober’s line that we detect design through our biological identity with the designer, do you agree or disagree that “design science”, if we may call it that, would be potentially applicable across both the human and natural sciences? The basic questions in reply are: Which ‘design’ is not detectable according to your ? How do we know that *anything* is not designed? I would argue that it is not. Are you arguing that it is? The DI-ID program is ID-in-nature-detected-scientifically. They do not *want* to call it ‘natural theology.’ They want scientific ‘legitimacy’. So, what you are proposing differs from what the IDM repeatedly states. We are agreed on this in good company with Steve Fuller, imo the strongest ID-as-science proponent living. He does not restrict himself to ‘design-in-nature’ though. And John Lennox would of course count highly too, but his focus is mainly apologetics. The IDM – standard bearers/inventors of ‘intelligent design’ theory – doesn’t want to be known for ‘apologetics.’ It doesn’t want to take on the label ‘natural theology’ for ID. Which ‘side’ one comes at ‘design’ + ‘intelligence’ from tells much about how it is presented. To answer your question, I don’t like the term ‘design science.’ That is not a term I advocate. There are many design theoriests, even scientists, whom the IDM ignores because those people don’t jive with the IDM’s political and cultural renewal agenda. If and when the IDM starts paying attention to social sciences and to ‘reflexivty’ things would change. Which design is not detectable according to your ? How do we know that *anything* is not designed? Ans to 2nd: we don’t, but perhaps we can know that some things are, and remain (scientifically) agnostic about the rest. Does cryptography lose its legitimacy if we can’t infallibly spot a message in noise? So, what you are proposing differs from what the IDM repeatedly states. Yeah, but I’m not in the program ;-). Yet my reasoning is (cf all 3 posts) that since “science” necessarily allows intuitive design detection in human sciences, it could legitimately do so in natural science, assuming a suitable theory/methodology. Were design thus to be detected as per the ID arguing-to-a-designer agenda, then the theory/methodology would also lead to the conclusion that the designer was to that extent similar to us, and could therefore lead to some limited conclusions about the nature of the designer (going back to Sober). That would be so even if it’s off the ID agenda. Sorry about that unfinished first sentence. I had to run and didnt carefully check back to the top before sending. The full question should read: Which design is not detectable according to your preferred meaning of design/Design? Yet we can and do know that some things are: human-made things. This is the non-category error usage of design. The category error usage, which you seem not ready to allow, is the place where we should be (scientifically) agnostic about the rest; but the IDM is seeking to abolish or overturn the category error and thus to (re-)validate design in biology (re- signifies a time when biology was more primitive than it is now). It has become like an ID trope now: Forensics, archaeology, cryptography and the (highly speculative) search for extra-terrestrial intelligence (FACSETI). The first three involve human-made things, the fourth does not (at least if unreflexively). Cryptography studies patterns known to be left by human beings; there is no ‘biological cryptography’  that wouldnt make any sense. Calls to ‘detect design in biology’  without identifying known designers  are speculative at best, just as is SETI. Notice the question put to Ted Davis over at UD for using forensic reasoning  he didnt return to forensics in his answer and perhaps wont go that route again. It doesnt really seem to be a sound argument. Allowing a metaphysical or metascientific view about origins of life called i+d or ID in the door is of course acceptable. Theres not much science to it, though, other than probabilities, denials and intuition, based on prior religious commitments. Agnostic Jew and DI Fellow David Berlinski offers no positive evidence of design, but rather simply rails against Darwins shortcomings and the Darwinists who infused Darwins ideas with ideology (cf. 2nd edge of the wedge). Darwin wrote very little if anything significant about origins of life, however, so he cant be blamed by ID proponents, instead of materialism, naturalism, etc. I dont find the not scientific phrase helpful. Yes, there is intuition involved. There is emotion and sometimes faith involved as well. This does not disqualify reflexive science of human actions (including design, among many other things) as being unscientific. I think youll find that if you allow reflexive science into the picture, your views in philosophy of science, e.g. the science demarcation game addressed by the 1990s science wars, will change. The not scientific language tends to support ideological scientism by an elite few fields (biology, chemistry, physics  Big 3), rather than general understanding of scientific principles, theories, methodologies, etc. in fruitful dialogue with philosophy and religion/theology. As for your design of a non-human, again, this sounds like science fiction or mere speculation. Describe for us, please, your non-human as far as you are not speaking apologetics. Show us how you conclude would be of the same order, using a non-theological argument. Our discussions of ‘Adam’ here have been anthropological-theological, rather than ‘natural scientific’ category. Wrt whether or not the designer was to that extent similar to us, I think youll find the only grounding for this is in theology, theosophy or (perhaps) cosmogony. And what would be wrong with that? Even the giant-evolutionist, structural-functionist completely ignored by the IDM, USAmerican sociologist Talcott Parsons, who can be seen for his American exceptionalist attitude, identified religion as an evolutionary universal, though he was not traditionally religious himself. People are religious because they/we (reflexive) are human beings. Thus, on such a topic as non-human designer, it is completely understandable or normal that they/we would involve their/our religiosity in the discussion; nothing wrong with that because we are people and not robots/machines or lower animals. Please don’t build yet another theory of ‘intelligent design in nature’ or ‘in biology,’ which would compete with their cultural and political renewal project! In short, pointing more to the Abrahamic God, Yes! Pointing more to design in nature or design in biology, No. Allowing a metaphysical or metascientific view about origins of life called i+d or ID in the door is of course acceptable. Theres not much science to it, though, other than probabilities, denials and intuition, based on prior religious commitments. I think my attitude to ID is “Why not?”, as a genuine question to explore. Are the arguments given against the identification of design in biology valid, vaolid with reservations or what? That includes whether it is right to speak of God’s creative activity as “design”, as well as the question of how to spot it if it is. Probabilities, to my mind, are very significant because of the role they play in most science. Although many self-organisation hypotheses are suggested, included some of those you mention above, all of which would reduce the contingency of life, I’m not yet persuaded they have any good evidence (making them self-organisation of the gaps!). Solutions based on known natural law seem to have huge shortcomings, not least because most biologists seem, at some stage, to resort to the necessity of high-contingency events. The jury’s out on how low the probabilities are, but nothing I’ve read persuades me that they fall within the plausible range. Low probability events occur all the time – but low probability events leading to progressively more organised outcomes don’t, except in the case of human design. That, of course, is the argument of ID proponents, and I can’t fault it: to attribute something, in the end, to an exceedingly lucky fluke, requires more of a faith commitment to naturalism than design does of a commitment to theism – or at least, an equal one. That, of course, relates I guess to the reflexivity issue. Since all scientists actually have prior commitments, their interpretation will be biased, unless they bias it institutionally be something called methodological naturalism. If one suspends that, then science must avoid theories of origins altogether – which some might say is a good thing. Since that isn’t going to happen soon, some balance to naturalistic conclusions seems not inappropriate. Now, building on what I’ve said in the blog on the human propensity to identify design, I dispute that a prior faith commitment is necessary to ID, because avoiding the design inference actually requires great support from an unnatural naturalist ideology. I’ve heard many tales of people born and bred in Soviet atheism who found the route to faith through no longer being able to sustain a naturalistic view of biological function. It doesn’t, of course, follow that they’d swallow the whole DI package, but I’m thinking of the bigger picture here. Getting back to Christian presuppositions (rather than apologetics), here’s another thought. We were studying Hebrews 1-2 in church today, in which Jesus is described as “the heir of all things, through whom [God] made the Universe,” and “the radiance of God’s glory and the exact representation [χαρακτερ = impress of a die] of his being.” So The Universe was made through an eternal Being, who has spent part of that eternity (so to speak) as a man, and even now sustains and creates that Universe as the God-Man in heaven. It may not be proper therefrom to assume a human component to Christ’s creativity, but that line of thought does preclude a Creator whose activity is wholly alien and incomprehensible. Am I saying that because the Bible teaches this, scientists ought to accept design? Not at all, but I am suggesting that where I came in, with Elliot Sober’s suggestion that divine design has no reason to be observable, is wrong in the case of the Biblical God. Whether or not it is recognised, Christian theology places a unique bridge between design in the human sciences and design in the natural sciences. Jesus is both designer and designed, or Creator and created, if you prefer.